I'm continuing to steadily work on the sashing of Dress Me Up! and I'm so pleased to say that all the sashing to join the 12 embroidered blocks has been completed! Woo hoo! I had *just enough* of the dark purple to eke out the narrow border around the perimeter of the blocks .. which is what I did want to do. I had exactly 2.5" selvage inches of the dark purple fabric left! That's really cutting it closely! The next phase is to work on the outer border. This border will be very wide so that the quilt will end up being a useful bed size quilt. 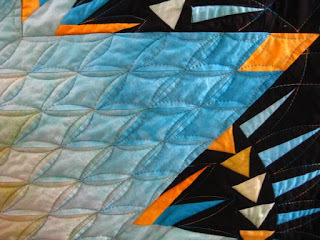 I do have a design sketched out in Electric Quilt, but I'm not terribly in love with it. It'll certainly work and Dear Daughter #2 likes it, so that's a big plus. If I decide to go in a different direction, that would mean another round or two or three of "Do you like this? or this? or this?" with Dear Daughter. The last give-and-take about borders was ... painful. Here is the progress, so far. This is just the "interior" of the quilt .. it still needs a very wide outer border(s). Now that I've finished my previous long term UFO, it's time to get started on the NEXT one. Yeah, the *next* one. I have a whole list of UFOs to work on (I'm sad to say) and this one popped to the top of the list. The pattern is "Dress Me Up" from the Bobby Socks Quilt Company. I chose to do the hand-embroidered version in shades of purple for my very favorite middle daughter. 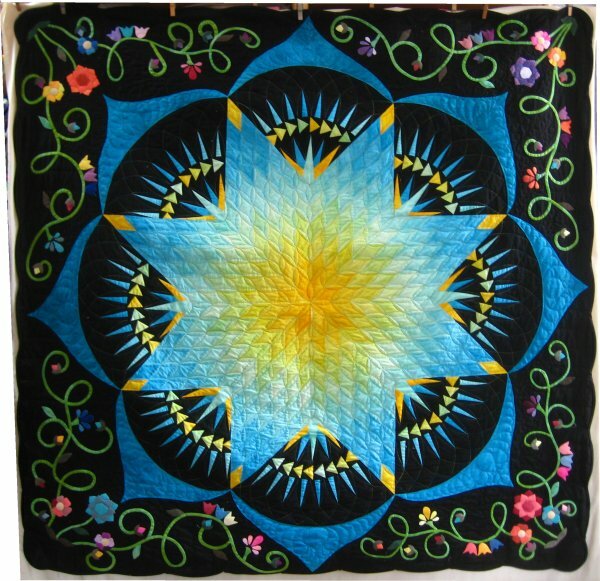 The first embroidered block was started in August 2010 and the last one was finished in April 2011. The 12 blocks were set aside for lack of inspiration in setting them. The pattern called for a grid layout, which is one of the most boring layouts ever .. IMNSHO. To be sure, there are times when a tic-tac-toe arrangement is perfectly acceptable but it is not what I wanted for this quilt. Just exactly what I *did* want remained elusive. Until I discovered a pattern titled "Spanish Tiles". Oh! I *loved* the sashing. Luckily Dear Daughter liked it also. Let's fast forward to now (2016). I resurrected the embroidered blocks, figured out I could probably just eke out the sashing in a fabulous dark purple fabric I had, so I began. I'm crossing my fingers on the amount of dark purple fabric. To hedge my bets, I'm going to do all the strictly interior sashing with this fabric and if I run short, will do the outer border in a compatible dark purple. So, here's the start of this next adventure. 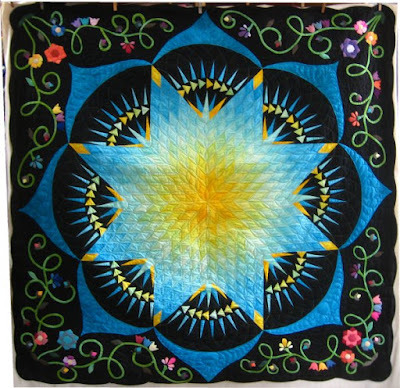 The top pieced border hasn't been made yet, as it needs the partial "X" blocks, as are present on the sides. It's easier to make the full "X" blocks right now so that I can be consistent (and remember how to do it!) than to switch gears. When it comes time to do the top, bottom and other side borders, then I'll do all the partial "X" blocks. Due to the precise amount of strip set needed to frame the embroidered blocks *between* the "X" blocks, this sashing is turning out to be a *major* PITA. AND DANG IT!! Now that I've seen the picture (looking at it from afar), I see the far left horizontal strip set segment is wrong .. the dark purple shouldn't extend all the way to the edge. Well, drats. It must come down and be corrected. How utterly annoying. Lone Star with hand-dyes ... done! Woo hoo! The last post I made about this long-term UFO was in October 2015 and I am overjoyed to say that I am finally FINISHED with this project! It has turned out to be so spectacular, so magnificent .. well, at least to me it is .. that I can hardly believe it. 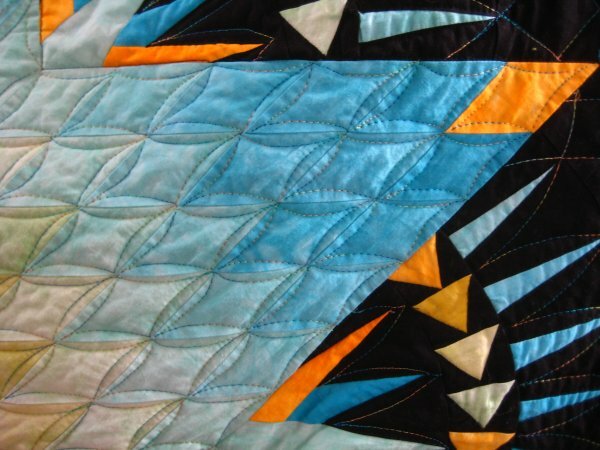 My "way back" machine tells me that I started this journey started in June 2011 when I purchased a packet of a 10-step hand dyed fabric, ranging from pale yellow through deep gold to deep turquoise. The colors were beyond description; they were stunning. I knew that I would make a Lone Star with them. You can read about the start in this blog entry. In my haste to work on it (BIG MISTAKE TO HURRY! 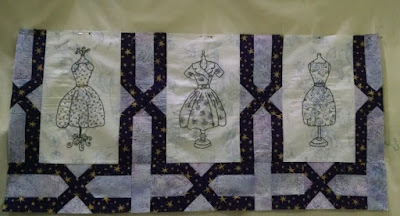 ), I used an inappropriate fabric for the New York Beauty blocks. I thought I could fix it after the fact (another HUGE MISTAKE! Do it right the FIRST time), I realized that there was no good fix for my stupidity and the New York Beauty blocks would need to be redone. You can read about *that* faux pas in this blog entry. I was so discouraged that I bundled up the Lone Star and the screwed up New York Beauty blocks and put them away. I just didn't want deal with them. But .. I knew they were there. From then until now, I have slowly but steadily continued to work on the appliques around the edges of the quilt. 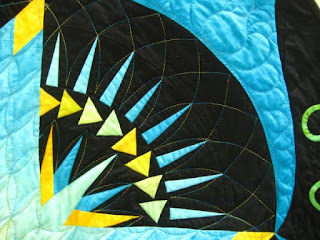 There is certainly a time and place for machine stitched appliques, but this quilt was not it. 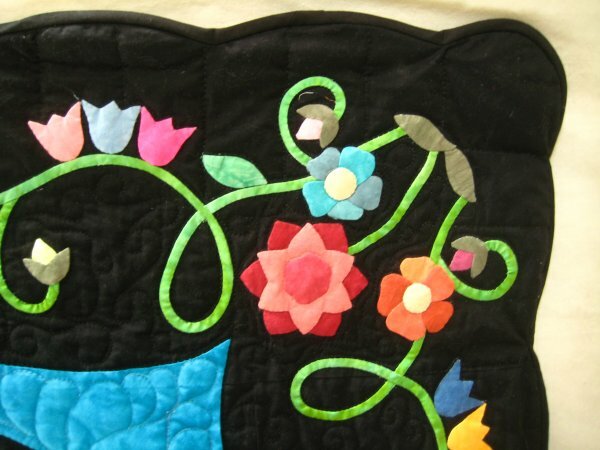 It took me a very long time to hand stitch all the applique flowers down. I knew the star itself would get continuous curves. I really enjoy doing ruler work on my longarm. I like the precision of it. I like how the decisions are taken out of my hands because the geometry of the design tells you want it is going to be. I also knew that there would be a messload of stitch in the ditch. All of the appliques. All of the New York Beauty blocks. Around the tiaras. Yeah, that's a lot, but not only did I needed to stabilize those areas with the stitching but the stitch in the ditch would emphasize them also. Lordy, it took a long time to do all that stitch in the ditch! As I work on areas where I know what I'm doing, I also let my mind wander and ponder what to do in the other areas. It was during one of these times that it occurred to me that Gothic Arches around the spikes of the New York Beauty blocks would be exactly perfect. Not only that but I found the *precisely perfect* variegated thread from Superior! So, that decision was made. The turquoise tiaras would get feathers of some sort because I like doing feathers. When I finally found a method of stitching feathers that made sense to me and I was able to master, I will put feathers anywhere. :-) But there are all SORTS of feather designs. I looked up tons and tons of feathers, both in my own reference books but on the internet as well. 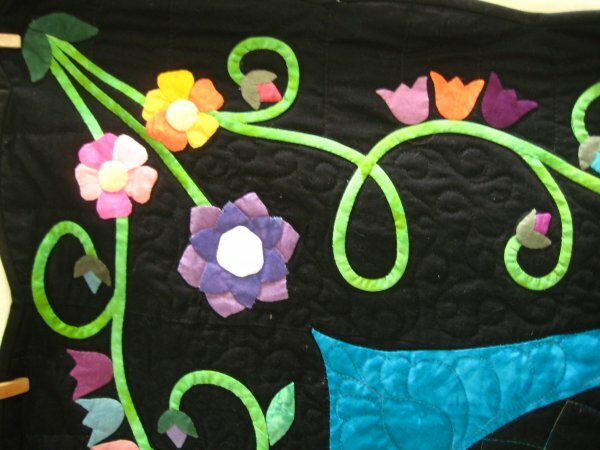 That left the background fabric around the appliqued vines and flowers. Oh yuck yuck yuck. I hadn't a CLUE what to do. The background absolutely needed to be held down but I really .. I mean REALLY dislike meandering and stippling. Then, it hit me! 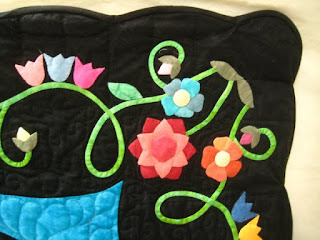 I don't need to do meandering/stippling around ALL of the appliques! I could do beadboard from the raw edge of the quilt up to the vines! And I like doing beadboard. That left only the background between the appliques and the tiaras. Once again, looking through my reference materials, I found a scrolly meander that would work. It would be a meander of sorts but with enough curly q's to make it interesting. Finally, it came time for the binding. The background fabric has straight edges. That's just standard when you're busy making the quilt. I hadn't really given any thought of what to do with the edges. 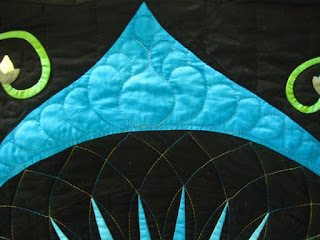 As I as gazing with deep affection on this quilt, it came to me that *scallops* would be the PERFECT finished edge. ONLY .. oh dear ... I hadn't exactly planned for scallops. There really wasn't enough excess fabric for scallops. Or was there? Hmmm ... maybe .. perhaps ... what if??? What if the scallops were very, very, very gentle? 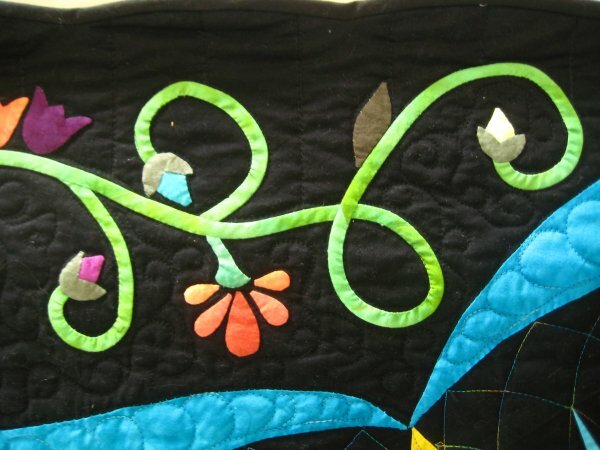 They would need to be because the appliqued vine comes VERY CLOSE to the edge of the fabric in a couple of places. But ya know?? I think it could work! Working very carefully and determinedly, I marked the scallops, applied the bias binding and hand sewed the binding to the back. Yes, they *were* very gentle scallops but they were exactly what this quilt needed to finish it properly. Occasionally ... I will see a kit that is just SO darling .. or the fabrics used are SO unique .. that I will make an exception and buy the kit. This is *such* an easy quilt to construct ... 7 wide strips of 8" fabric; each strip has one monster. 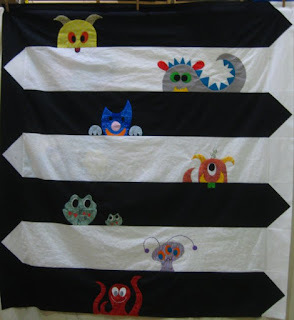 While I chose to do needleturn applique for the fabric portion of the monsters, that method is NOT mandatory. In fact, the designers specifically say that whatever method you like is the one you should use. Their version was done with fusible webbing. When I had finished the top, I pinned it to my design board to admire it. I grinned at those silly little monsters. BUT ... it just seemed so PLAIN. There were no borders .. just the 7 strips of fabric. I wanted to jazz it up ... just a little. It occurred to me that if I put Flying Geese on the ends of the strips, it could look like the strips were arrows. I liked that idea. Now, it looks like I have black arrows going in one direction and white arrows going in the opposite direction. 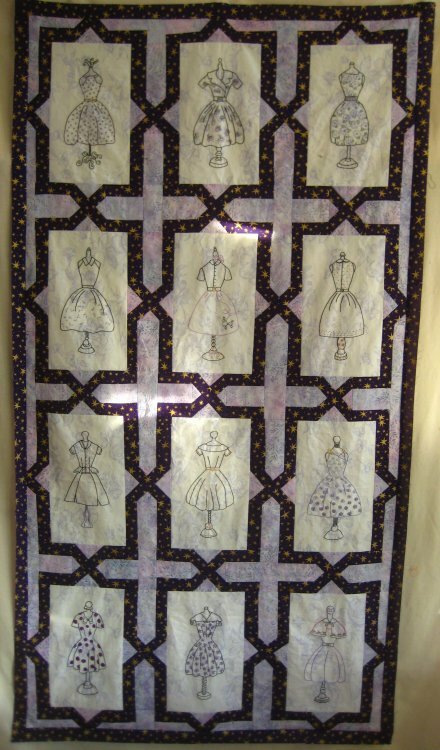 I really like this cute little quilt. It'll finish around 52"x56". My favorite oldest daughter's mother-in-law helps to run the Santa Cruz Toddler Care Center in Santa Cruz, CA. 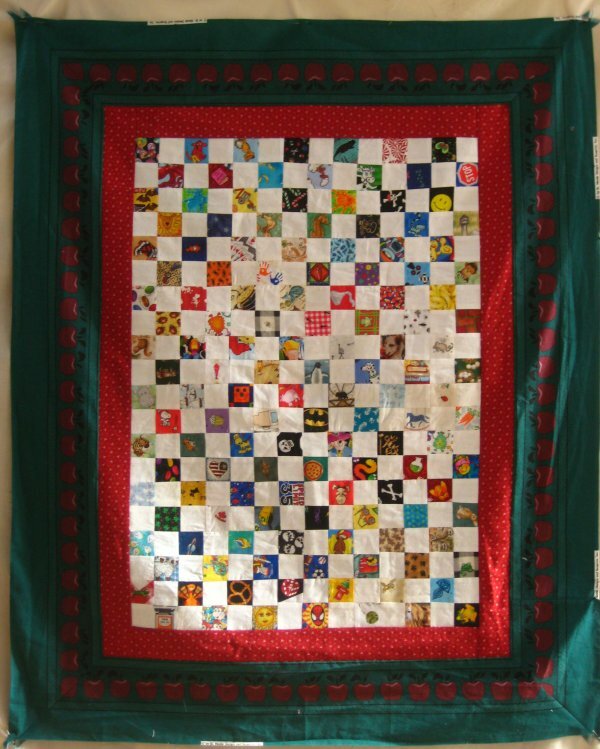 Every year, they have a fund raiser and I volunteered to make a quilt (or two :-) ) for them. Eventhough I am "thisclose" to finishing a long-term UFO, I just could NOT resist starting a new top, especially when I knew the piecing wasn't going to take very long. 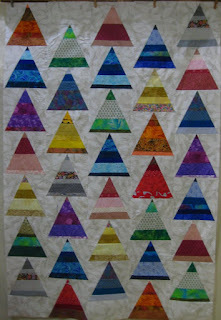 Tina Craig, of Seaside Stitchers, posted a picture of a scrappy pyramid/triangle quilt that I knew (well .. to be honest .. I only had high hopes) would use up a fair amount of strips in my scrap drawers. She didn't post a pattern, but any experienced quilter can see it is clearly a "triangle in a square" block. 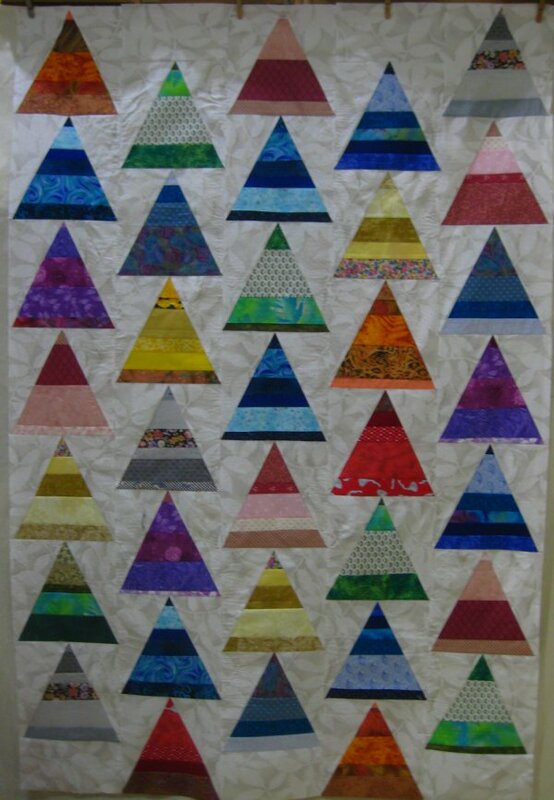 Instead of using one fabric for the triangle, you "create" your own fabric by sewing strips together, then cut the triangle from the strip set. This is my version. And no, it didn't seem to make an appreciable dent in my scrap drawers. They are still as full as ever. This top is about 45"x69". It was easy enough to make and I just kept making more blocks! Concerned that the scrappy pyramid quilt might actually be too big for their purposes, I asked what size they'd prefer (something I probably should have done before but .. eh .. I was having fun.) I was told a crib size quilt would be great, so I dug through my scraps again and rediscovered a whole STACK of 4-patch I-Spy blocks that had been unable to be used in a previous project. Both of these are still tops-only, so the next step will be to load them on my longarm to get them quilted, bound and mailed off. I used to have a protocol. Well, protocols are good only if you follow them. I've become increasingly lazy and quite the lamer. While the Delphi forum does get more or less regular updates, my blog has not; neither has Facebook. Those of you who maintain a blog know that it takes a considerable amount of time to get an entry ready to post. That's time I had decided that I would rather be spending on sewing. :-) Time marches on and my one remaining brain cell becomes tired and then I discover that I can't remember if I've ever talked about some of the projects that I've finished! So, that is what I'm going to be doing now .. a series of posts to bring my blog kinda/sorta, more-or-less up to date with where I am in my creative endeavors. 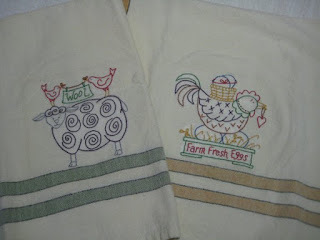 First up is a series of dishtowels I hand-embroidered. I really do enjoy hand embroidery. 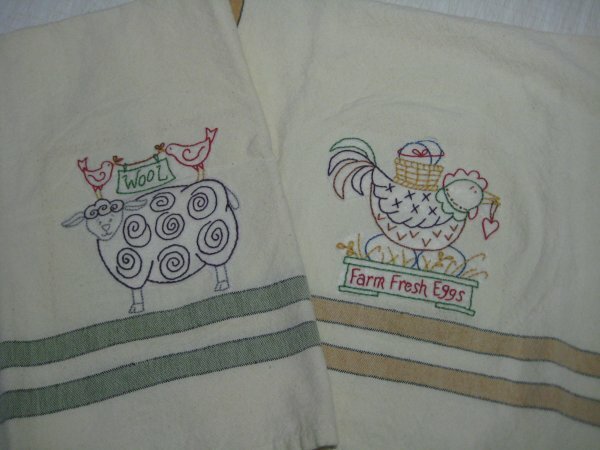 Sometime during the summer of 2015, I bought a set of blank, plaid dishtowels at a quilt show and some poultry themed and some coffee themed designs. I also bought an incredible (new to me) product called "Sticky Fabri-Solvy". Solvy makes water-soluble stabilizers. This stuff is mounted (temporarily) on a stiff piece of paper and can run through your printer. Once a design is printed on the Solvy, you peel it off the paper much like a Post-It note and stick it onto your embroidery fabric. 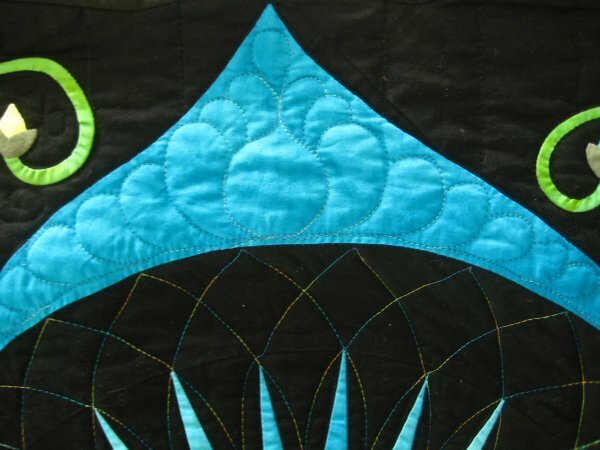 You embroider right through the Solvy because, since it's water soluble, once you launder it, it dissolves, leaving only the embroidery behind. What a FANTASTIC product! It completely eliminates the tedious part of hand-drawing and transferring the embroidery design onto the foundation fabric! No more pencil lines that you worry about covering! The stuff is awesome. This set was done for my middle daughter. 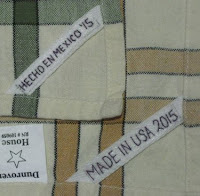 I took one of them with me on our September trip to Mexico and actually got it finished, which is documented in the little labels I stitched for the towels. The next set was stitched for one of my nieces, who can't seem to function without her morning caffeine. 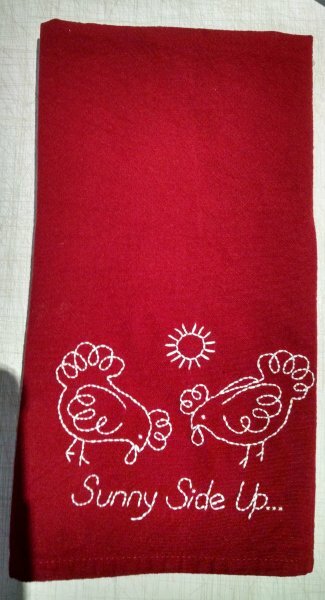 The last singleton dish towel is for my youngest daughter. 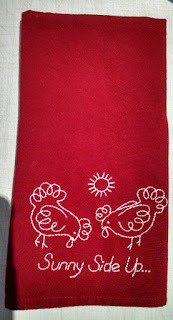 She has a preference for the color red and I found a solid red blank dish towel for her.